Nielsen recently completed a survey of over 25,000 consumers online across more than 50 markets from Europe, Asia Pacific, the Americas and the Middle East on their attitudes toward trust, value and engagement of traditional advertising. Across over 50 countries measured, a majority of online consumers surveyed trust most forms of traditional advertising and agree that it delivers value by promoting competition and supporting a wide range of media. Trust in traditional advertising is up: Consumers today are more trusting of every marketing channel tracked compared to two years ago, save newspaper advertising, trust in which declined a marginal 3%. Peer recommendation is the most trusted channel, trusted “completely” or “somewhat” by 9 out of 10 respondents worldwide. Of the major paid advertising channels (online, outdoor, print, radio, TV and theatre), television and newspaper are the most trusted media, whereas text message ads on mobile phones are the least trusted paid advertising channel, winning the confdence of just 24% of consumers globally. Online search, banner and video ads are trusted by fewer than half of respondents. Interestingly, Latin American consumers tend to be the most trusting of advertising, and European consumers the least trusting. Nielsen measured consumer trust in 16 different marketing channels by asking consumers “To what extent do you trust the following?” Across all channels, an average 56% of respondents indicated that they trust advertising “completely” or “somewhat.” Peer recommendations top the list, trusted by 9 out of 10 consumers; while text message based ads perform the lowest, trusted by just 24%. Across the 16 measured channels, non-media channels are more trusted than paid media channels. After peer recommendations, consumers trust branded websites, consumer opinions online, editorial content and brand sponsorships ahead of a broad list of paid advertising channels. This importance of peer recommendations and consumer opinions online justifies the attention marketers continue to pay to the use of social and consumer-generated media. Of the paid advertising channels of online, outdoor, newspaper, magazine, radio, TV and theatrical, TV and newspaper are the most trusted media with 61% of global consumers saying they trust TV advertising – the same percentage that trust newspaper advertising. Online and mobile advertising have perhaps the steepest hill to climb for consumer trust: in addition to text message advertisements, online search, banner and video ads are the only channels trusted by fewer than half of respondents globally. The good news for online is that consumer trust in that medium is growing. The percentage of global consumers trusting banner ads grew 27% between 2007 and 2009 (from 26% to 33% of consumers). The percentage trusting ads in search engine results grew 21% (from 34% to 41%of consumers). Though TV and newspaper are the most trusted advertising channels overall, trust in ads across both media varies considerably by region. Trust in TV advertising is much higher than average in Latin America, where 74% of consumers trust it, and lower in Europe, where just half (49%) trust it. Similarly, trust in newspaper advertising, which tied as the most trusted paid advertising vehicle globally, varies as a trusted source by region. 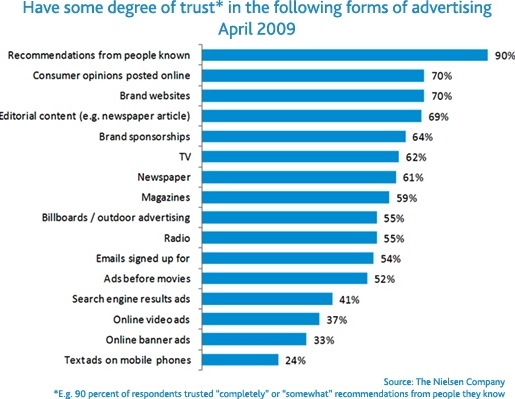 As with TV, Latin Americans are the most trusting of newspaper advertising (75%), while just half of Europeans trust it. The higher-than-average trust that Latin American consumers exhibit for TV and newspaper advertising is consistent across almost all measured channels. To get a better sense for the impact of age and gender on trust in advertising, Nielsen analysed trust by these characteristics among North American consumers. Gender appears to have very little impact on levels of trust in advertising across the measured channels, but age does make a significant difference. In all but two of the channels measured (consumer opinions online and e-mails), North American consumers under the age of 20 exhibit higher than average degrees of trust. The higher propensity for trust among young consumers is most visible in theatrical ads (North American consumers under 20 are 42% more likely than average to trust theatrical ads), sponsorships (24% more likely to trust) and television ads (23% more likely to trust). Consumers under 20 aren’t the only ones to exhibit unique levels of trust in advertising. Persons 30-34 are uniquely prone to trusting online advertising of different forms. In North America, this is the segment of consumers most likely to trust ads served in search engines, online video ads and online banner ads. The Nielsen Global Online Consumer Survey shows that consumer trust in traditional advertising has risen since the previous survey was conducted in 2007. Consumers continue to trust the opinions of other consumers (either people they know or consumer opinions posted online) more than paid advertising, including online, outdoor, print, radio, TV and theatrical channels. Branded websites are the most trusted advertiser-produced medium, tied with consumer opinions online, while two traditional media – TV and newspaper – are the most trusted paid media. In addition to trust, consumer perceptions on the value of traditional advertising are generally positive. Approximately 80% of consumers globally acknowledge the value of advertising in funding art exhibitions, cultural and sporting events and helping companies succeed and create jobs. A lower share of consumers (67%) recognises the value of advertising in the basic media model of underwriting low cost and free content. Perceptions on the value delivered by advertising vary across regions, with Western European consumers the most skeptical and Latin American consumers viewing the value of advertising more favorably. Though a rising segment of consumers, specifcally teenagers, seems more engaged with online video ads than TV ads, overall consumers in the survey perceive television ads to be more effective than online video ads at communicating humorous, emotionally touching and informative messages. Variations in consumer trust across markets, demographics and media have implications in the best way to engage consumers in a fragmented media world. What’s more, understanding the value that consumers see in advertising – and the levels of engagement they feel – can help marketers to best appeal to the marketing interests of their audience. Design Inc is an integrated agency with a specialism in traditional advertising. View our advertising portfolio here.